Ok, I almost had a heart attack last night…no, not from the KFC, but from a commercial that ran so quickly, my little mind almost missed it. I was just sitting there watching TV with my husband minding my own business when I saw a Pink Bucket of KFC and the OMG Pink Ribbon?! My first thought was WTF? Then I thought for an instant that it must be a joke? But it wasn’t. It was a real commercial. I couldn’t quite grasp the idea of these two joining forces for good. One is already clearly good, even angelic, but the other in my opinion…that should be obvious. NOT GOOD! NOT HEALTHY! NOT ETHICAL, HONORABLE or NOBLE. I could go on, but you get the point. I’m not a fan. I’m not an idiot either. I believe they mean well here and have probably raised a ton of money for the cause as well. The problem I’m having with it is the connection between eating fried foods and cancer in general. I know it’s not KFC’s place to educate you against eating poorly, after all they WANT to sell you their food to make money. That’s the business they’re in, but isn’t there some kind of responsibility here to give the public the right information? Although I LOVE the Foundation for the Cure, I don’t think this is the right affiliation to raise the funds. Overall health and wellness begins with choices that are the starting point for healing. Encouraging people to eat crappy so called food in exchange for money is not the way to go. Help us find a cure and get clogged arteries and gain weight in the process. Thank you for giving to us…Seriously, the general public will catch on, but I hope they don’t have to eat buckets of KFC before figuring it out. I know everyone does their best to use common sense, but I was really offended by the commercial and the mere thought of these two working towards the cure without KFC making serious changes to the health of the food they are selling. The responsibility and honesty of the food should be everyone’s concern. If it’s a change you want, then go to the heart of the matter. In MY opinion and I’m no expert here, this is a bad idea and sets a scary precedence for future fundraising efforts. There are many things that contribute to cancer, but I really don’t want to see mixed messages in the future. Seriously, if I want to raise money for an Alzheimer’s cure, do you think I’m going to team up C&H or another large sugar grower knowing what sugar does to the brain. 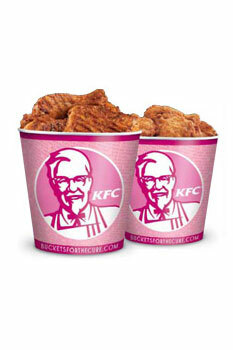 PLEASE SUPPORT THE CURE AND SEND THEM YOUR DONATIONS, BUT DON’T EAT FRIED CHICKEN TO CONTRIBUTE. BY DOING SO, YOU ARE CONTRIBUTING TO YOUR OWN POTENTIAL ILL HEALTH. One right and one wrong don’t cut it in my book.